Making BESCOM bill payment is easier because of online. Most of the cities in India having the electricity bill online payment option. Banglore is not an exceptional in that case. By the use of BESCOM online payment method, you can complete the Bangalore electricity bill payment quickly. You don't want to stand in the queue. BESCOM - Bangalore Electricity Supply Company is one for electricity distribution divisions in Karnataka. It is responsible for power distribution in 8 districts of Karnataka under the name of Karnataka Power Transmission Corporation Limited (KPTCL). Bangalore also comes under its power supply coverage. KPTCL buys electricity from power generating company of Karnataka Power Corporation Limited (KPCL). BESCOM is providing an efficient and reliable electric power supply to the Bangalore people. It has given customers the facility of online electricity bill payment. BESCOM online payment has more ways to complete the process. Here I have shared some more secure and easiest ways of BESCOM online bill payment methods. You just follow the below steps to pay BESCOM online bill payment through official BESCOM login. You don't want create a login. 2. On the screen, you should enter 'Customer ID' or 'Account ID' and click the 'Submit' button. 3. The control will be redirected to another page, Where you can see your Bill payment details. 4. Fill the all required details like 'Mobile Number, Email ID and Payment'. After that, click the 'PAY NOW' option. 5. It will take you to the Payment page powered by Bill Desk. Choose any one of your convenient payment options and Pay BESCOM Bill payment. 2. Enter the 'Account ID' & Captcha and Click the 'Continue' button. 3. Fill the require details and complete the registration process. 4. Now login the BESCOM account. Find and click 'Online Payment' link. 5. In account summary, you can find the 'View Bill / Pay Bill' Link. Click the link. 6. Select the Bill to be paid and Check the ‘Terms and Conditions’ tick box. Click on ‘Make Payment’ button. 7. Choose the mode of payment. More preferable payment option ‘Bill Desk’ online banking mode. Click the 'Pay Now'. 8. Now you will be redirected to Bill Desk interface. Enter your mail id for your transaction confirmation. 9. 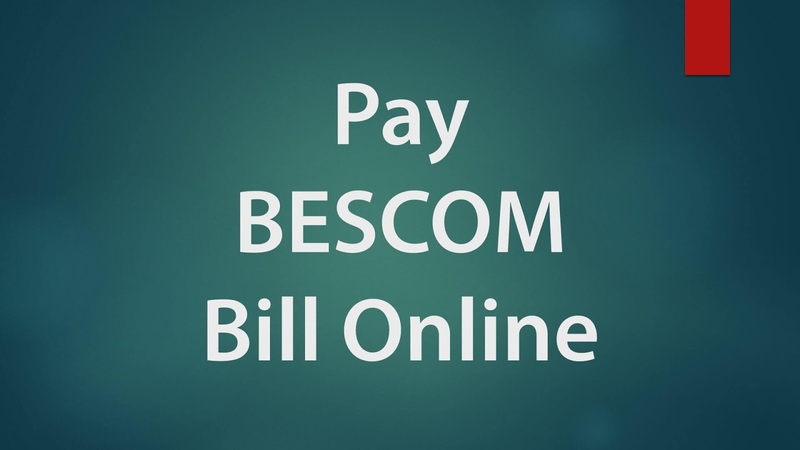 Select any one of your convenient payment options and Pay BESCOM Bill payment online. 10. After successful payment, you can see the bill payment acknowledgement with 'Transaction ID'& 'Reference number'. Now take the print for reference. 2. Create the Bill Desk Account by clicking register link and Login the account. 3. You will pay through any one payment mode of Mobile Banking, Net Banking, Credit Card or Debit Card. Your payment bank should be on the list Bill Desk partner's list. The banking partners of Bill Desk include State Bank of India, Bank of Baroda, Union Bank, HDFC, IDBI, ING Vysya, DCB, BOB and many others. Check the complete list in Bill Desk's portal. Still, If you have any doubt regarding this post, don't hesitate to share with us through comment section given below. If you have any suggestions, You can share all by comments.